Central and northern New York State Sen. Patty Ritchie and New York State Agriculture Commissioner Richard Ball view the drought's effect on an Oswego County Christmas tree farm. At the Hemlock Haven Christmas tree farm in Sandy Creek, Oswego County, frail, burnt orange pine trees stand out in sharp contrast to their emerald green neighbors. Owner and operator Michele Forsyth said with combined drought and sustained heat this summer, she's lost more than 10 percent of the trees on her farm. "Perhaps even more because we don't know what the ramifications will be farther on," Forsyth said. "We just need more rain and unfortunately, there's nothing we can do about that. There's no way to irrigate 125 acres. We don't have that kind of capital." New York State Agriculture Commissioner Richard Ball, State Sen. Patty Ritchie (R-Oswegatchie) and representatives from the U.S. Department of Agriculture visited Forsyth's farm Tuesday. Ritchie, the state Senate Agriculture Committee chairperson, said this story is all too common. "The devastation is pretty heartbreaking," Ritchie said. "It doesn't really matter at this point what type of farmer you are. They're seeing a real, devastating effects across the board." Ball is is touring farms like this across the state to assess the extent of the damage from what he calls the worst drought in 20 or 30 years. The federal government recently declared Oswego County and 23 other counties in New York state as a natural disaster area. Ball said his office is now helping farmers across the state connect with the resources that come along with that declaration. "We're trying to bring all the resources to bear that we can," Ball said. "There's some low-interest loans for people to help get through the year, but there's also some funding available to help develop water resources on the farm." Ritchie said the New York State Legislature plans to add other financial assistance for farmers into next year's budget. In the meantime, officials are working to add Jefferson County to the natural disaster area. Ball said their application is pending. 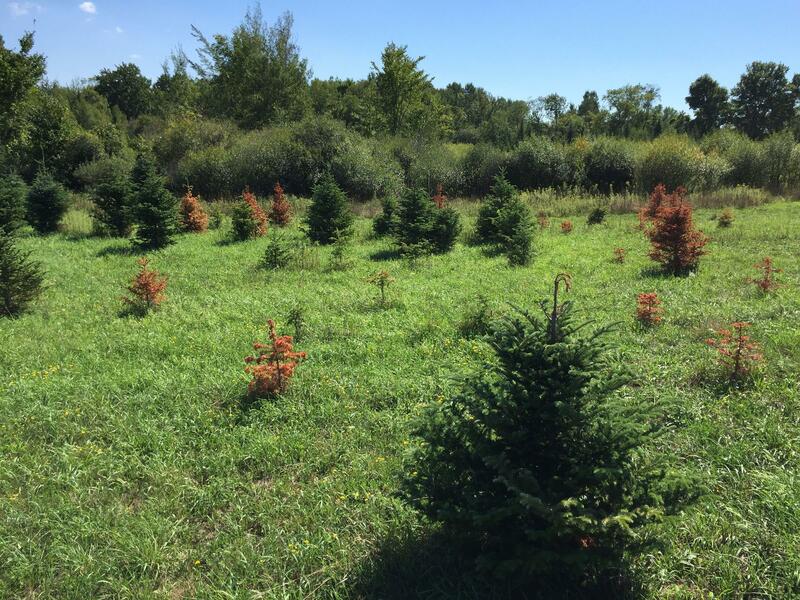 The summer drought and sustained heat have killed thousands of pine trees at the Hemlock Haven Christmas tree farm in Oswego County. Parts of western and central New York, including the Southern Tier, remain in a severe drought category according to the U.S. Drought Monitor. More dry weather could impact the state in the months ahead. Jefferson County hopes to be included in a federal drought disaster declaration in the next week or two. On Tuesday, The U.S. Department of Agriculture listed 15 counties, plus nine contiguous counties, as drought disaster areas. Walking among rows of green, picturesque vines, Tom Higgins of Heart & Hands Wine Company in Cayuga County pointed to a densely-packed cluster of pinot noir grapes. That density is typical for pinot noir, but this year, the cluster is even more crowded, which has implications for the last month or so of the growing season. "When a cluster is nice and compact like this, rains in the latter part of the growing season are the curse of the winegrower," Higgins said. "It’s just not a good time to see rain." New York farmers are experiencing the worst drought conditions in generations, and while the industry may suffer a setback, it will persevere. That's from Dean Norton, the president of the New York Farm Bureau, a lobbying group for agribusiness. Norton says one immediate concern is for dairy farmers. He says the dairy industry is going through a price downturn, and as they receive lower prices for their products, dairy farmers are also facing the prospect of a shortage of feed this fall.